Overview: Seamless 0.120” (3mm) wall 4130 chromoly tubing. Precision mitered, mandrel bent and TIG welded for beauty and strength. Available smooth or dimpled to accept original equipment H-D hand controls. 9.5 INCHES TALL, PULLBACK 8.25 INCHES & 20 INCHES WIDE . These bars look great on: Long and low diggers; up and out choppers with a girder front end or extended Narrow Glide hydraulic forks; hardtail Sportsters; anything with a rigid frame, king-and-queen seat and/or a tall sissy bar. Construction: 1-inch O.D. x 0.120 wall seamless 4130 chromoly tubing. Construction: 1-inch O.D. x 0.120 wall seamless 4130 chromoly tubing. Bends are created with internal mandrels on a CNC bender to reduce flat spots in the radiuses, and all welded joints are precision mitered and TIG welded. .
Threaded bungs on vertical uprights are CNC-machined chromoly steel with1/2-13 t.p.i. holes to accept stock H-D mounting bolts. . Available with dimples for stock and select aftermarket Harley-Davidson hand controls, or smooth for aftermarket levers..
Fitment: The aggressive 45-degree backsweep gives late-model Sportsters the laidback look of an Easy Rider poster bike. The mounting bungs are welded on 3.5-inch centers to fit stock and select aftermarket Harley-Davidson triple trees. 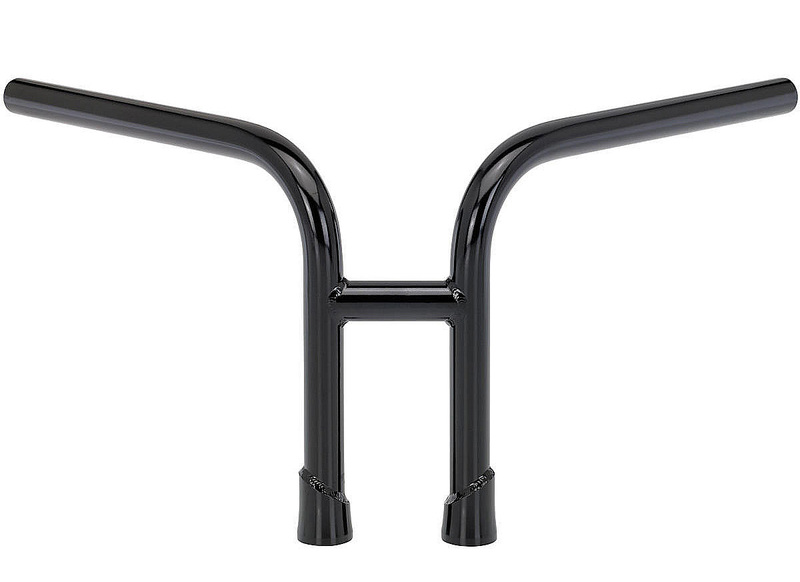 Fitment: These bars are designed to fit top clamps with a spacing to fit most modern H-D motorcycles. Exact spacing is 3.5” on center.